Fashion experts agree that every girl should own a black dress. When it comes to prom, a formal black dress will always look classic, elegant and glamorous. What makes the complete black prom dress look though, doesn’t depend solely on the dress style you wear. Accessorizing right is the difference between making your black dress look stunning vs tacky or cheap. Perhaps the safest and most elegant way to pull off a black prom dress without overshadowing is to wear jewelry in simple and minimal lines. These would be plain round and thin necklaces, rings or necklaces without any spikes or stones. There is no need to buy something that combines many fancy patterns and lines as these tend to look more gypsy and cheap rather than elegant. The same ‘rule’ we have discussed above also applies to colors. In most cases, using solid color metallics like silver, bronze or gold is the way to add some spark to your dress without looking excessive. If you still wish to add some color e.g in case your skin tone is pale, combining a single metallic with small color stone in a contrasting color e.g red, pink, or green only would also be great. 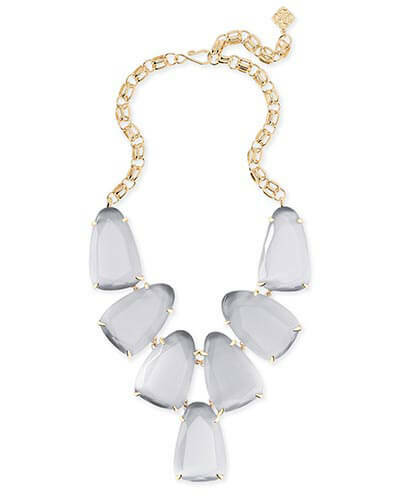 Check out Kendra Scott’s fabulous necklaces, they have many more on their website like the one below. Another very important rule when trying to accessorizing and following the ‘minimal’ rule. 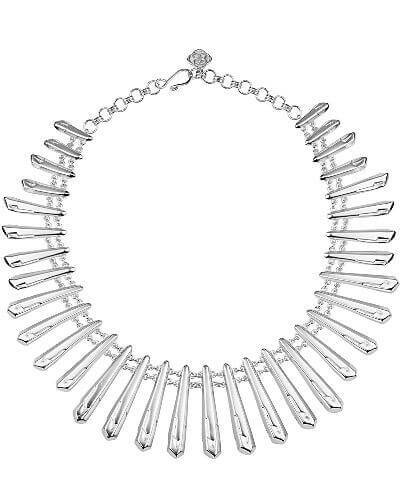 Fashion experts agree that especially in formal events like prom, it’s best to wear only up to two jewelry pieces at time e.g a necklace and a ring, a necklace and a bracelet, earrings and a necklace, etc. 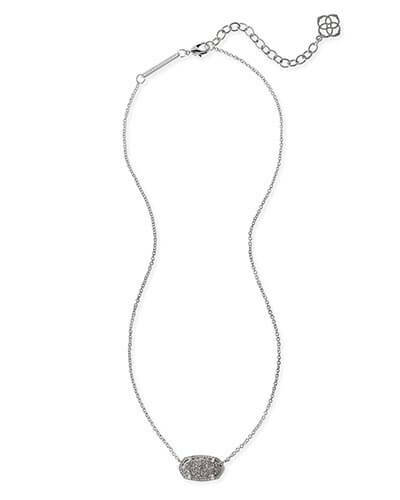 This is to give your outfit a touch of glam without being fancy and excessive. Remember, you are going to wear your shoes and carry a bag so you really don’t need to wear multiple pieces. A common mistake that girls attend a formal event like prom, and especially when wearing a dress in a dark solid color like black, is carrying a bag in much different style and color than their jewellery. Black is a color that matches with everything, but if you choose a suede blue bag for example when you are wearing gold necklace and shoes, this will take off from the style and glam you are trying to show off. If you can’t find a bag in the exact same color as your jewelry and shoes, opt for high-end styles and fabrics like silk and cashmere with metallic details. Although it’s best to keep your lines and styles minimal, some prom dress styles require that extra little something that will make them pop. If your black prom dress is a strapless or sleeveless gown with straight, sweetheart, or bandeau bust living your neck and possibly upper boost exposed, a statement necklace like this one here will create a very interesting and glamorous contrast. 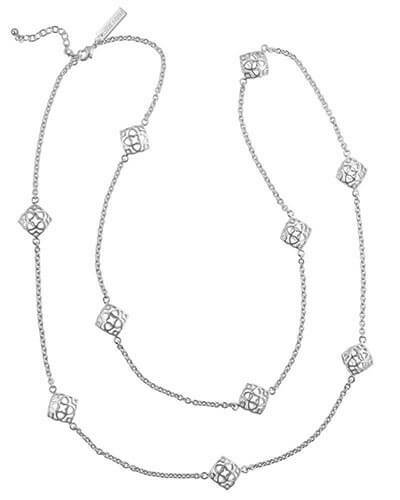 Since fine formal prom jewelry costs anywhere from $50-$300 on average (unless you wish to purchase something really cheap that will wear out after a few uses), it would be wise to invest in a timeless and flexible piece (or pieces) that will match other formal outfits as well aside from prom e.g your cousin’s wedding. You don’t want to be left with a piece that costs a few hundred and you’ve only worn once. Last but not least, an area that many girls overlook is the appearance of their nails. The color and style of your nails is also an accessory on its own as your hands will be directly exposed and emphasized on prom, especially if you are wearing a ring or a bracelet. Although going for a french manicure is the most classic and safe choice, it’s best here to go for a solid bright color in a contrasting color to black. Some nail polish shades that will look great with a black prom dress: hot pink, rose gold, Hollywood or blood red, teal, glitter in all shades, and aventurine green. Avoid these shades as they don’t create any contrast: navy blue, white, graphite gray, pale pink, pale yellow, and soft pastel colors in general. There are a couple of colors that do not go with black no matter what and they are navy blue or brown. Other than that choosing a black dress is a very wise choice because there are so many colors and styles of accessories that you can choose from.